29 x 14.5 x 24cm. 29 cm long is 11.5 inches. 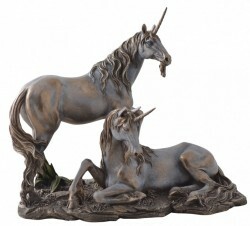 Stunning and heavyweight cold cast Bronze figurine of a resting Unicorns. These figurines have a lovely finish and are great quality.